• The delightfully named “Schadenfreude” – or joy from others’ sadness. A man walks into a bar. Ouch! It was an iron bar. Includes fart jokes (embarrassment), banana skins and other physical comedy scenes. 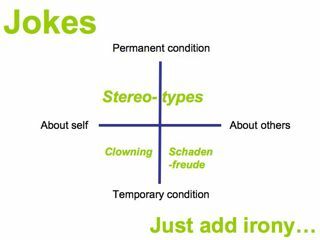 • The ironic stereotype where a permanent condition of self or others changes meaning in the telling. English beer tastes so bad its best to pour it straight down the toilet and cut out the middle-man. English beer is a wonderful example of British efficiency – it tastes so bad its best to pour it down the toilet and cut out the middle-man. So now you know. How to make funny jokes and both use or fully appreciate irony. Handy, eh?